You guys were mostly little people during the 1990s, so I wasn’t listening to much contemporary music. We were either listening to stuff from my very 1980s collection or kiddie tunes that were designed to help you learn to skip count or be obsessive teeth-cleaners. We were so poor; I was very grateful that you still thought of your fingers as toys. Maybe we didn’t have a radio? I forget. Anyway, we were on our own little island and I was very busy trying to keep you healthy and trying not to lose my mind. So when Kurt Cobain died, my reaction was a very uncool, “Who?” and I’ve maintained near-total ignorance of his life and music for about twenty years. 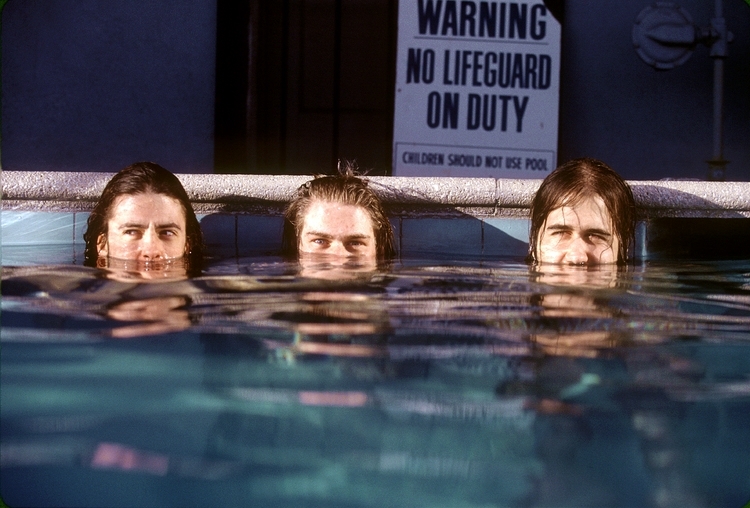 Kirk Weddle ‘Nevermind’ cover shoot. In the past year, however, I have found a weird little non-radio niche that exclusively plays grunge music and I’ve spent a lot of time there getting acquainted with it. I read somewhere that Cobain’s daughter doesn’t particularly like Nirvana’s music and while I think that’s a little sad, it’s also probably a good thing for her. The best songs are very, very dark, full of images of traps and despondency. I’m no music critic, but the contrast between the depressing lyrics and hypnotic circles mixed with huge bursts of musical energy is really seductive and jarring. It is not recommended music for sad people. At the same time I can see why Nirvana was greeted with such acclaim — it’s an amazing expression of its time and if I’m not entirely clear here, amazingly good rock. As part of my ignorance of all the Cobain mania, I had never read much of anything or watched any of the documentaries about him. There was apparently a tremendous appetite for endless versions of his story, and as usual, it didn’t dampen the publicity machine that there were so many photos and videos of a very pretty man to illustrate the heartbreak. When I decided to get some background, it was from the HBO documentary, Cobain: Montage of Heck. There are quibbles with its accuracy, and I have to admit I felt strongly that some of the people being interviewed or narrating (including Kurt Cobain) were lying and exaggerating. Even given that, while the facts may be distorted, I think the trajectory of a gifted junkie is beautifully and painfully presented. Cobain was basically my peer. He’s perpetually in his twenties now, so the idea of him growing up as a likable, goofy kid with an excess of bad thoughts was startling and eerily familiar. He could have been my neighbor in the seventies, or he could have been my little brother, trying to navigate a crappy suburb full of drugs and neglect. I never expected to find him so relatable. We listened to all the same music, working from the Beatles into punk junk and I think that’s why listening to it now, I can be slammed back into a very different state of mind. It’s not really a place where I want to linger. While I can’t exactly recommend the film or the experience I’ve had in the past year of wading through grunge, I have a few thoughts. The idea that you can vent your angry or depressed feelings to “get them out of your system” in my opinion is just a way to spread the poison. Expressing your poison probably won’t work, even if you work really hard at it. Like Cobain, you can scribble and diddle and generate a magnificent pain gallery, but you’ll still have the pain. It is still a focal point. How awful would it be to wake up in the morning to another day of peddling despair? More specifically, I believe that broadcasting your darkest feelings is not helpful. I have pounded out plenty of words to get my ideas sorted out when I have been very low and it can help, but I would suggest not publicly going all Sylvia Plath. At best it’s pointless and at worst it’s hostile. By all means draw and write it out and then burn it. Cobain was filled with poison and in that state he turned to… more poison. Anyone who has watched someone battle addiction and mental illness can readily see that drug use is gasoline that is not going to put out the fire. You want to play with fire? First put down the gasoline. It’s simple, but not easy. There were two other guys going through all the same things with Cobain and they appear to be far better than okay. Just lucky? I don’t think so. It would be marvelous, I think, to hear what fifty-year-old Kurt would be saying about surviving his twenties, or what music he would be making, but that can’t happen. If you are feeling “stupid and contagious” turn away from toxic things and people and keep working to find a safe place to heal. People do that every second of every day. You can too. There are people who want to help you as long as you are willing to help yourself. Just a little bit. Previous PostPrevious Where can I go online when I am having a bad trip?